RIVBOS Children's Polarized Sunglasses Keep your child's eyes protected from the sun year round with RIVBOS sunglasses. Available in bright, bold colors, our sunglasses block 100% of the sun's harmful UVA & UVB rays and meet AOA (American Optometric Association) specifications for non-prescription sunglasses. Made of flexible Dupont rubber, they also feature polycarbonate impact & scratch resistant lenses. Polycarbonate impact and scratch resistant. Completely flexible and virtually unbreakable arms made of 100% Dupont rubber. SOFT SILICON AND UNBREAKABLE MATERIALS- RIVBOS always walks at the forefront of the world of stylish high-tech frames and lenses. With our revolutionary soft silicon and unbreakable materials, our sunglasses frames perfectly resolve the breaking issues. Along with our attention to detail, we take great pride in knowing that our product is safe for your children to wear. 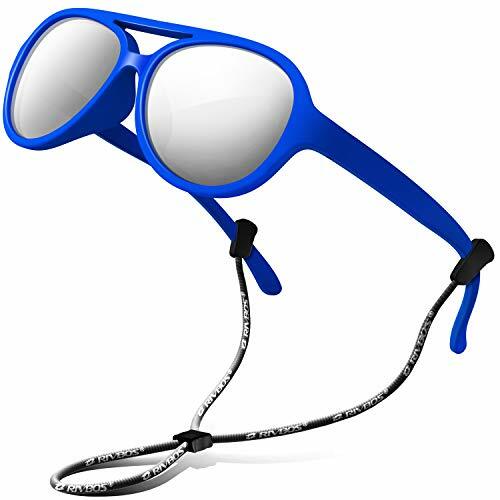 SUPER CUTE AND COLORFUL DESIGN- Our sunglasses provide various color assortment for parents to choose. Both boys and girls can find their suitable sunglasses in RIVBOS store. LIFETIME BREAKAGE WARRANTY ON FRAME- We provide lifetime breakage and warranty on Frame and Lens.Please feel free to contact our customer service anytime if you feel unsatisfied or confused. 30 DAY MONEY BACK GUARANTEE- All RIVBOS customers enjoy 30 Day Money Back Guarantee. Customers can return and get refunded in case the purchasing is not satisfied for any reason. You have no risk to try. If you have any questions about this product by RIVBOS, contact us by completing and submitting the form below. If you are looking for a specif part number, please include it with your message.